Welcome to this very special Blog Hop!! 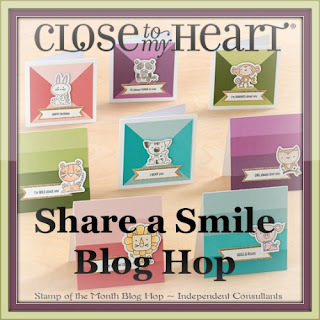 Today were are sharing artwork created with this month's special - Share A Smile! Close to My Heart has a special stamp set that is available all year long called Punny Pals. 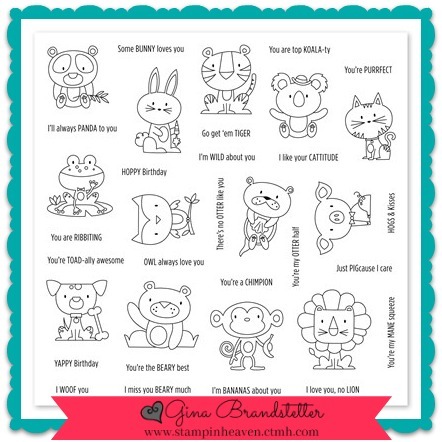 When you purchase this stamp set, $7 is donated to Operation Smile! If you came from Michelle Rowley's blog, you are on the right track!! This hop is a big circle so if you just joined us, when you get back to me you will have completed the hop. If you get lost, you can find the complete list of hoppers HERE. During the month of October, Close To My Heart is offering a special Share A Smile Card Kit that coordinates with this stamp. 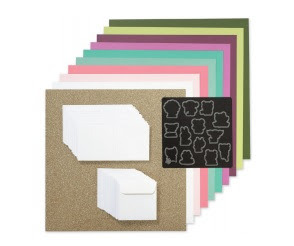 The kit includes 10 sheets of cardstock, 32 3x3 cards & Envelopes and Thin Cuts that coordinate with our Punny Pals stamp! All this for just $39.95. The Punny Pals stamp set is NOT included with the kit so be sure to add it to your order! I just got my Punny Pals stamp set and couldn't wait to play with it. These little stamps are just adorable! I created two cards using inspiration from a recent post by Jennifer McGuire. I stamped the Punny Pal and then cut the front of the card to create a flap. Here is a little closer view of each card. I used watercolor pencils and our waterbrush to color this frog. Then I went over the frog with our Clear Shimmer Brush to give it a bit of shimmer. I used the silver dots from the Bear Christmas Dots for accents. On this card, I used the ShinHan Touch Twin markers to color the bear. Because the marker will bleed through the back of the cardstock, my Lagoon liner covers the back side of the bear also. (That was not needed when I used the watercolor pencils and waterbrush on the frog card). I used our new Bashful Pearls to accent the card. If you love these little Punny Pals, be sure to get the stamp and add the Punny Pals Thin Cuts THIS MONTH! While the stamp is available through the Annual Inspirations book period (retires July 31), the Punny Pals Thin Cuts are ONLY Available during the month of October or While Supplies Last! Let's hop over to Kathy Burrows' blog and see what she has created! Really cute. I like the flaps. Jennifer McGuire's posts are always a great way to get inspiration for ways to use our stamps. Love it!! and I saw her video too - LOVE how you used the Punny Pals :) fabulous cards! These are super cute Gina! What a cute card style! Cute cards, with nice embellishments.